Today is the first time I'm taking a closer look at a product from Vizo, this firm focuses on external storage solutions, cooling products and accessories. The subject of this review is their Ninja II notebook cooler - this product was designed for 15" and 17" notebooks with widescreen displays. 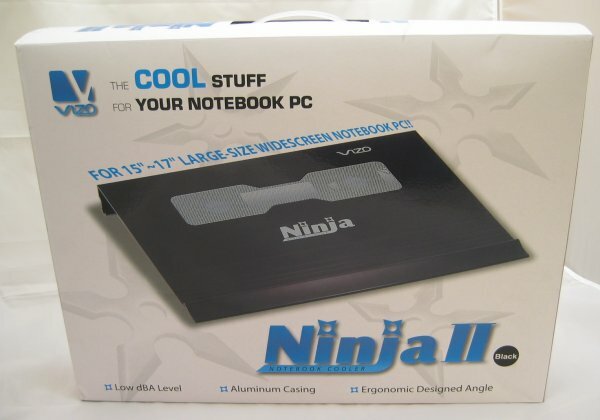 The Vizo Ninja II features an aluminum housing and is advertised as a silent and efficient laptop cooler. The Vizo Ninja II ships in the following box and when I received this product I was a bit surprised by its large size. It's much bigger than laptop coolers I've reviewed in the past. The entire cooler is made out of aluminum, I got the version with a matte black finish but this product is also available in silver. 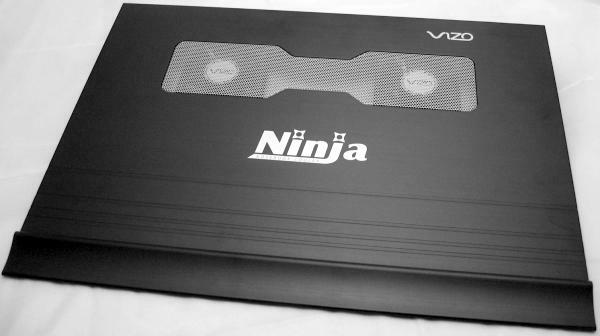 The front features the Vizo logo, a large Ninja logo, a couple of ridges and a mesh for the two fans.